April is Jazz Appreciation Month! What better way to appreciate jazz than by celebrating musicians who are still alive and performing, and thus able to appreciate your appreciation of them? Technically this column will appear on the last day of March, but since April is only one day away, it seems only appropriate to make this the first JAM-inspired review. Ellis, Wynton and Branford Marsalis are such hugely well-known names in jazz that one naturally expects great things from anyone in the family. People tend to assume that talent runs in families, but that’s hardly the case. Being around it all the time may give a person an interest in music, but the only path to success lies along a road called “Work, work, and work some more.” Work smarter or work harder, but work. Trombonist Delfeayo Marsalis has released very few albums under his own name, mainly because he has been too involved in the technical side of recording (and working for others as a sideman) to spend much time actually in front of the microphone on his own. The album I want to tell you about this time around is Delfeayo’s third release, “Minion’s Dominion”, which was released in 2006 on the Troubadour Jazz label. “Minion’s Dominion” was released in 2006 but it was recorded in 2002, in case you were wondering how the late Elvin Jones, who died in 2004, managed to be involved in this project. No less than five of the seven songs that comprise “Minion’s Dominion” were composed by Delfeayo. The opening song, “Brer Rabbit”, is one of them and gets things off to a delightful start. Beginning quietly with a strident bass, which is quickly joined by the piano, then drums and finally the man himself on trombone, this piece builds to a fine, warm intensity that will have your foot (or other available appendage) tapping before it’s done. “Lone Warrior” likewise gets off to a quiet, somewhat plaintive start, with Harrison’s sax dominating the first few minutes. Eventually Delfeayo steps up and takes over and it is here that his skill with the ‘bone really shows through. When he steps back, Miller gets a moment to show what he’s got, and all the while 70+ year old Jones is beating a grove in the background. This is the longest song on the disk, running over eleven minutes, and it carries you along with an intensity that belies its somewhat slow tempo. The title track is livelier fare, moving as it does right along, driven by both of the Marsalis’ brothers and Jones on the drums. “Just Squeeze Me” is a Duke Ellington composition that the group romps right through, a lively nine minutes that goes by all too quickly. “Lost In The Crescent” is a most unusual piece of music, in that it tells a story in music. With a slow start, almost a dirge, it builds to a swinging blues piece. There don’t seem to be any tracks from “Minions Dominion” online, but here is a great video of Delfeayo and father Ellis performing the song “Sultry Serenade” before a live audience. And here is Delfeayo performing the Herbie Hancock classic, “Watermelon Man”. 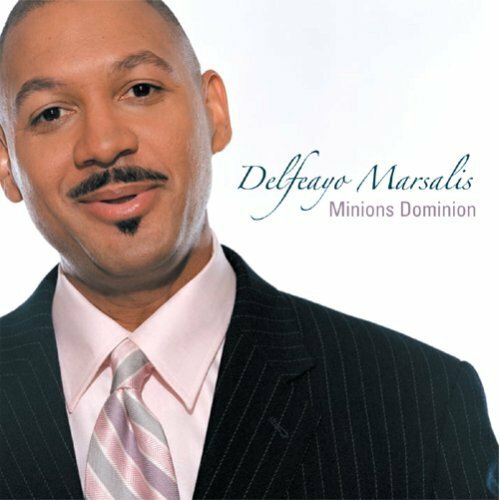 When it’s all said and done, I feel quite confident that you’ll find Delfeayo Marsalis’ album, “Minions Dominon”, a fantastic addition to your personal playlist for a Saturday, or any other, night! You can learn more about Delfeayo Marsalis and his music by visiting his web site. The original news release for “Minions Dominion” can be read here.